The game visually is decent. There's some care taken with animations and the maps aren't too big or spacious. There's some percent mapping that has gone into the game when it comes to housing, too. The writing has a few issues, mainly bad use of punctuation. There's a lot of ellipses at the end of sentences and choices and it comes off as kind of shoddy. I would have liked to have seen more dialogue but alas, the game had issues that stopped me from seeing it. The sound is... well, sound effects are okay, what few of them there are. There's no music. At all. It leads to an empty atmosphere and doesn't help the game shine at all. 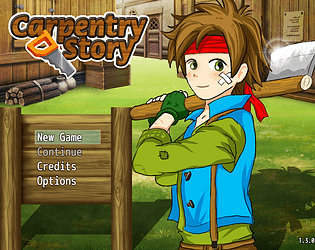 The story is simple - your grandfather left you a farm, uh, carpentry store in a town that has died out. Restore the town to it's former glory. Unfortunately, you don't get to progress beyond that point in the story due to the downfall of what could have been a good game: bugs. The gameplay involves interacting with on-map events and menus. This could have been pretty great. In fact, it looked promising, feature-wise. Build a town by fixing it up. And what systems are in place work well - you can chop trees by interacting with them, build different items (though you'll only want planks to fix everything in town) by making choices and fix structure issues in houses over town by interacting with them. That would have been a good start if there'd been more and it wasn't quite so clunky. I could forgive the clunky menu choices (having to pick the same choice over and over and over in order to do the same thing is a bit annoying) but bugs barred the way through the game. The biggest issue was the bug where if you go in the inn again it restarts the whole intro scene. The issue with this is that you need to talk to the old lady in the inn after the first day in order to continue the plot. Otherwise you're just left to fix the different houses and then... nothing. There's nothing you can do because no-one will enter the houses even after you fix them. There's no one to talk to, nothing else that needs fixing, no more content to play (bar the smithy who arrives on the weekends). Just blank nothingness. There's also an option to move the furniture in your house around, which is actually pretty cool except for two issues. One - you start with a bed, table and bookcase but the event that teaches you how to move stuff around removes the bookcase, leaving you with just a bed and table. Two - after this event, every time you enter your house you are given the event again, with extra beds and tables each time. And you can't sell either, so your pack slowly fills with beds and tables. Another issue is that saving the game takes a long time and I can't for the life of me think why that would be. It might be the customised menu. It might be some of the events or scripts causing issues. Whatever the case, it lags for well over 10 seconds (I counted almost 30 at one point) just to save... and it uses the default save feature of the engine, as far as I can tell. A gameplay question is why you can't sleep if you're not empty of hearts. Sometimes you might be down to a sliver of heart and have to find a tree to beat on in order to remove it so you can progress to the next day. What if you want to sleep and progress the day without being dead tired? There's also a house where you can't go left or right in (the house next to the well). This is likely due to passability issues on the floor tiles. Another house has a teleport that misplaces you. Oh, and do enough and you can run out of trees, meaning no sleeping, meaning no progression, meaning end of game. Honestly, at the start I was enjoying the game and looking forward to some relaxing town building. It seemed like a great idea and I wanted in. The bugs wrecked it, sadly, and having no way to progress after a certain point certainly ruined what had been a promising start. Also, grinding. I don't mind chopping down trees - it's easy to do and didn't take long. I did mind having to spam through the same choice over and over again just to make some wood to fix things though. That was annoying and should have been handled better (there is a number input system in the engine that could have helped a lot). The lack of music certainly didn't help - something boppy and energetic or even peaceful would have helped to ignore at least some of the grind. Running out of trees was also a big problem. That stalled any kind of work I could have done eventually. It would have been nice to have something like in Stardew Valley where you can replant trees and they grow over a number of days, so you could replenish the stock (so to speak). The game's theme was about growth and restoration. It was about taking a dying thing and making it better - and the game started out doing that well. Fixing the houses felt like you accomplished something and that you were reviving a community, growing it up. However, the bugs stopped that in its tracks, leading to a stagnant game. The up-to-date link you posted isn't working anymore. And well I tried the download that is available in the game page but I got stuck in the beginning. After going to bed and waking up, if you enter the old lady house again, you go back to the introduction (the part where she tells the story) and then probably because I was going around the village looking around, suddenly it was midnight and I got stuck in an empty house. Can't even move from the front door. Very weird. Other stuff I'll mention so you can look it over: Right at the beginning the train is a bit glitched when it's going away, I can't really explain it, but it was like a black edge around the left part of it. It's nothing big but it should be easy enough to fix I think. When I was looking around the village and inside the other houses (before getting stuck), I noticed that some had a bunch of bugged places, like I couldn't walk to one window or to the inside doors even tho the path to it was clear, no holes or anything, just empty floor. At least two houses had this problem. There was some grammar issues and words missing in the dialogue too sometimes, starting in the lady's speech right in the beginning when she was saying something about her granddaughter going away. All these are little things that made me just quit the game even tho the premise of the game seems sooo good. I'm honestly a bit disappointed. I liked the idea of being able to repair all the houses of the village. It sounded like fun. The workshop for making the furniture looked really cool too. I was excited to play this! >_< But anyway... I hope you'll release a more stable version of the game when you can and that after the contest you'll keep working on it too. Because this could be a really good game! Keep it up! I would be very grateful If you leave comment after trying stable 1.3 version. Thanks! I liked the concept and story. Crafting was fun even if it was a bit of a grind. But one thing did happen to me; I repaired my room before the instance where it says "I should redecorate when I finish repairing" so that just loops every time I enter my room. I had something like 8 old beds and tables last time I entered build mode haha! Thanks for playing. I think you just found another bug... I'll fix it right away. SOooo cute game. Most exciting . Cute game! Was excited to see that you posted this fix (couldn't sleep in the version submitted to contest), but now I cannot leave the house because "I should go to bed." Let me know when you sort it out? I'm curious to see what happens when I entirely fix one of the houses. Fixed! Try to re-download please. Thank you for your feedback!